Well done Andy on getting the girls through a pretty hard test on top! I believe some credit may be due to both our goalies today. I certainly noted Merina getting her feet and body into the right place quite a few times in the 2nd half to keep shots out - and they were the type of shots that just as often go in - so keeping a clean sheet today was a good achievement, especially as Yarraville are no pushovers and had their strongest players on the pitch the whole game. Well done to all the defenders and whole team for their commitment to defence. Annabelle played a very solid game today and cleared a lot of balls as did our other key second half defenders Gemma, Sarah and Cate. We had some excellent running and clearances out of defence which created quite a few attacking chances, but the fast turf, slope and wind at our backs did make it hard to control the ball and get shots away. Congratulations to Chiara playing her first game in the front line for scoring a very composed match-winning goal and her first goal for the club. Well done girls. 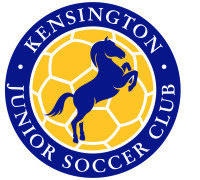 It was another really strong performance by the 12 girls playing with Kangas today ... welcome and special mentions to Ella and Ruby H for their first game with us and glad you could both get quite a few touches of the ball and you both showed that the step up from Under 9s was not too daunting for either of you. From the kick-off we had plenty of control of the ball and we certainly controlled the game for much of the day. There were lots of great passes today and i liked to see us able to take our time with the ball and to look for a player who was in the right position not just any player. This really paid off and most of the goals we scored today were the result of a strong build up and great team work rather than just pure individual skill. Congrats to all who did so today and several even found the back of the net with the non preferred foot. Our defenders was as solid as ever today and although our opposition managed a few breaks forward with the ball they did not really look like troubling our 4 goal keepers who manged to keep a clean score sheet. The end result of a 3-1 win which flattered our actual performance. It was a game of two very differing halves. The first half was not our best. There weren’t many palyers switched on. There was no running, tackling, talking or working for our team mates. We were ball watching allowing our opposition to dictate the play. The ground conditions and wind did not help. Midway through the first half on one of our few forays forward Del expertly finished from a tight angle to give us an uncomfortable 1-0 lead. 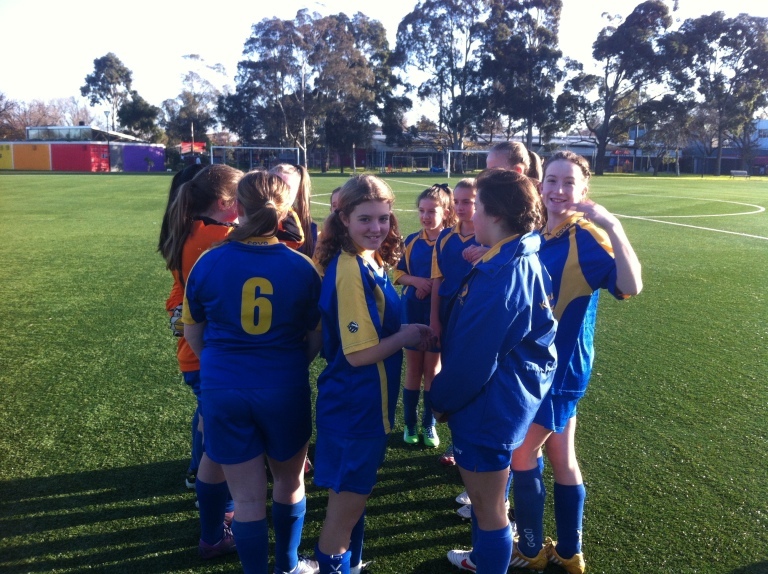 This was shortly after cancelled by unstoppable shot which resulted in a goal from Sporting Whittlesea. 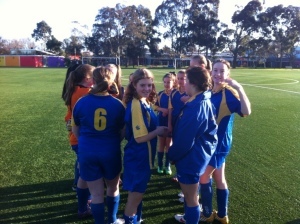 The first half ended 1-1 and the challenge was put to the girls at half time. To their credit they improved in the second half where they dominated the space on the park and played the rest of the game in our forward zone. It still was not our best display but we came home with the goods. Shreya playing on the right hand side of midfield scored her first goal of the season after making a run forward to help her strikers. She was in the right position to tap the ball past the keeper. Good running on the wings Shreya. Being a forward or midfielder means lots of tireless running to get to a position where the ball might or might not come. The final goal came from Del intercepting a goal kick. The game was a bruising affair. It was good to see us walk away with the points even though our work ethic was not present for the first half. We were lucky that we only played half a game and won. If we want to continue these winning ways we will need to play both halves and arrive to the game switched on. There are five rounds to go. Four games and one bye. Let’s make it a goal to come home strong and win the last four.